Some fear it, some work towards it while others just accept it…after all, It is obviously our choice to look fit or live with that bulging ponch.. Diet and regular exercise play a pivotal role in determining the circumference of our stomach however, few Yoga Asanas allow us to concentrate more on the abdominal area.. Method: Lie flat on the ground, with your back on the floor. Raise your upper body and legs to an angle of 30 degrees and hold the posture for 30-40 seconds, then relax. Repeat this asana for 10 times to begin with, graduating to 30 times. Breathe normally all through the work out. Ushtrasana : It is the counter pose to naukasana. Method: Stand on your knees, with heels facing upwards. Arch your back, placing your hands on your knees one by one. Hold your head behind pushing your belly outwards. Hold this posture for 30 seconds and repeat 30 times. Bridging: Stretch till you feel the burn! Method: Lie flat on the floor with your hands resting by your sides, feet flat on the floor, shoulder width apart and knees bent. Now, contract your abdominal lower back and gluts and slowly lift your midsection to form a bridge from your knees, through your hips to your shoulders. Hold this position for a few seconds, and then slowly lower. Chakrasana – Dealing with the Wheel! Method: Lie flat on the floor, fold legs and keep gap between them. Inhale invert and place your right hand next to the right side of your head, inhale again, invert your left hand and place on the left side of your head, balance the position, take a deep inhale and lift your body up with head curled inside. Do not close your eyes in this position. 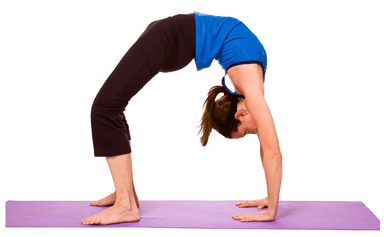 hold this position for 10-20 seconds and then slowly comeback on the floor. Carefully place your lower back on the floor. Counter this pose by making Pawanmuktasana. Method: Lie on the floor with your legs off the floor in a right angle. Keep your shoulders just above the floor. Breathe in and bring your knees in towards your chest, while lifting your upper body to an angle of 30 degrees and breathe out while you relax. Repeat this exercise 15-20 times to begin with. Do it like the lady!